BETHLEHEM (Ma’an) — Israel’s army and Shin Bet agency on Monday said they had thwarted a suicide bombing planned by five Palestinian suspects from Tulkarem, a statement said. The five suspects allegedly confessed that Yasmin Shaaban was planning a suicide attack using an explosive belt while disguising herself as a pregnant Israeli woman, the statement said. The suspects also allegedly confessed to planning other attacks, such as shootings, bombing a bus with Israelis soldiers, and kidnapping a soldier. 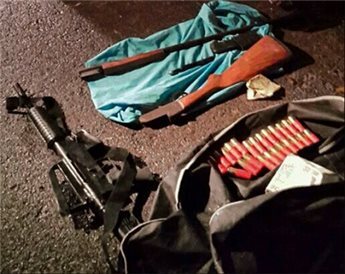 Weapons, ammunition and chemicals used to make explosive were found during the arrests, Israel’s army said. The attack was reportedly to be carried out under the responsibility of both Hamas and Islamic Jihad. The suspects were named as Menadel Mupak Tupik Tekaz, Maataz Mupak Tupik Tekaz, Yasmin Tisir Abed Al-rahman Shaaban, Abed Al-Halak Haashem Abed al-Charim Masimi, and Maruan Mahmud Mahmed Tzedki and were detained in October and November. Both Menadel Tekaz and Shaaban were charged in an Israeli military court in the occupied West Bank with conspiracy to murder and membership of an illegal organization, referring to Palestinian political parties.